Huge Wisconsin Related Sports Move ~ The Bucky Channel - The World of Sports from Wisconsin's Perspective. 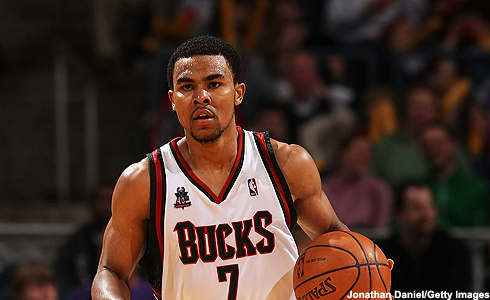 No, I'm not talking about the fact that the TimberWolves signed Ramon Sessions to a 4-year, $16 million offer sheet. I could give two shits about Sessions at this point. It's not that I don't like him, because I really, really do, it's just that if he was going to be a Buck next season that is something that would have happened a long time ago. This is just kind of a whatever move at this point. The real story is that after months of dominating Nashville, Corey Patterson is finally on his way to Milwaukee! Even though Nashville is in a tight pennant race, the Brewers brass felt that Patterson was more needed at the big-league level, so we'll see just how much they use him. He is a contender to join the Brewers outfield ranks for good next season, although the chances of that decreased when Mike Cameron said he'd take a pay cut to stick in Brewtown. If there was one thing that could revitalize my interest in this Brewers season, trust me, it was Corey Patterson. And I'm not being facetious here, this is legit. Actually, now that I've written this article, are you telling me Sessions is only going to earn $4 million per year with the T'Wolves? Wasn't his agent trying to get him like $8-9 million for him. I know that the Bucks would go over the luxury tax if they signed him, but for a price like that then maybe we should hop on board. I know the Bucks are leaning towards making this Jennings' team, but a bargain is a bargain. Happy Labor Day for real this time. they were trying to get the mid level exception, which is like 5.5 or something like that. per nba rules, the first two years of his contract would have to be around the mid level (rule started when gilbert arenas got a huge offer from the wizards and the warriors couldnt retain him). theres a player option for the fourth year, so really its probably a three year 12 m dollar deal. very affordable for what he brings to the table, but i have a bad feeling he wont be matched.